MusixLib is advertised as a “new Chrome extension for a quick music click-and-visit experience.” Users are told that they could play albums of their favorite artists for free and will get unlimited access to music if they install this piece of software on their computers. Unfortunately, some users consciously install it on their computers. It can be downloaded directly from the Chrome Web Store https://chrome.google.com/webstore/detail/musixlib-start/ifhnjalcekbmmeknpgnkpghldbbhanen or its official website http://www.musixlib.com. What those users who install it on their PCs willingly do not know about it is that it is a potentially unwanted program, or PUP. If you have installed MusixLib yourself too but do not like how it works, you should delete it right away. We suggest that you get rid of it if it has been installed on your computer without your knowledge as well. MusixLib is not anything near harmful malicious software, so you should not find its removal complicated. Of course, if two words “add-ons manager” do not tell you anything, you should read this report first before going to delete MusixLib from your system. MusixLib promises to improve users’ experience and provide unlimited access to free music. It does seem to be beneficial software at first sight, so we are sure that some users install it on their PCs themselves consciously. Unfortunately, they do not find this piece of software very useful. Our specialists do not consider it very beneficial software either because research conducted by them has clearly shown that MusixLib only sets a new page as a homepage and New Tab. Your default search tool will be left unchanged, but you will still see the page set by this potentially unwanted application each time you launch your Google Chrome browser. Luckily, it is compatible with this only browser, so your other browsers will not be affected. The page promoted by MusixLib looks like an ordinary search provider at first glance. It contains a search box that returns search results when users enter search queries. In addition, it contains the so-called quick-access buttons that open popular websites. You do not need to have MusixLib installed to be able to access them. You can open them by typing their URLs in your browser’s address bar. In addition, specialists say that you might see some modified search results if you perform web searches using the search tool set by the MusixLib potentially unwanted application. Last but not least, it is very likely that some details will be recorded about you automatically if this piece of software stays active. Your search queries and links you click will be recorded as well if you use its search tool. If you do not like something about this browser extension, you can erase it at any time. Consequently, it will no longer perform any activities on your system. 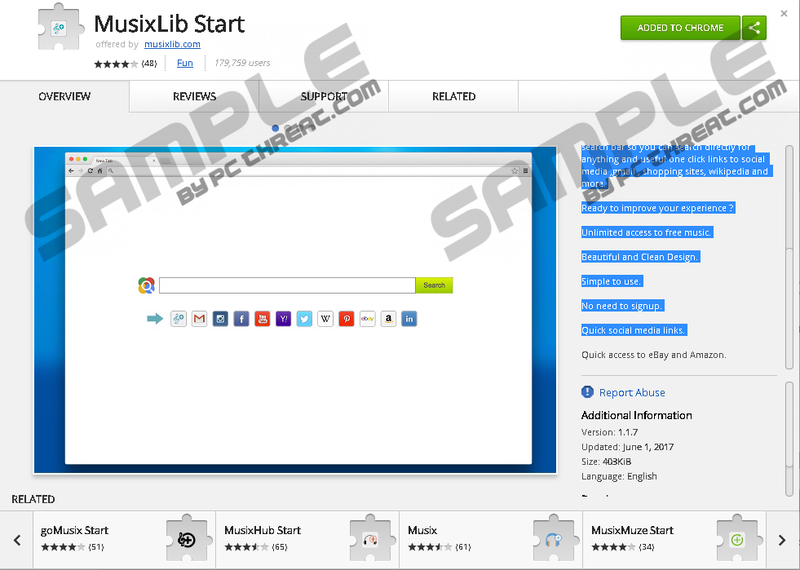 Some users install MusixLib directly from the Chrome Web Store or its official website with the single click, but we are sure there are still more people who cannot explain how and when this piece of software has been installed on their computers. Our researchers confirm that it might enter users’ PCs and affect their browsers without their knowledge because research has revealed that it might travel bundled together with other applications. Since users tend not to read the information provided for them, they agree with the installation of suspicious software without even realizing that. It is not the only way MusixLib is spread. Specialists say that it might be promoted via pop-ups too. They are usually displayed to users when they open specific websites promoting software; however, if you see various ads on your screen periodically, you might have an advertising-supported application active on your system. If you can locate it on your PC, remove it mercilessly as well. MusixLib is far from dangerous malware, so its removal will not be very complicated. All you need to do is to open the add-ons manager, locate this extension, and then click the button with the Trash symbol. Our instructions (find them below this paragraph) will help you to eliminate it, but you should know that you can delete all undesirable applications automatically as well. To do this, you need to acquire a powerful antimalware scanner, install it, and then simply launch it. Quick & tested solution for MusixLib removal.